The next five days are dangerous ones for Oreos. 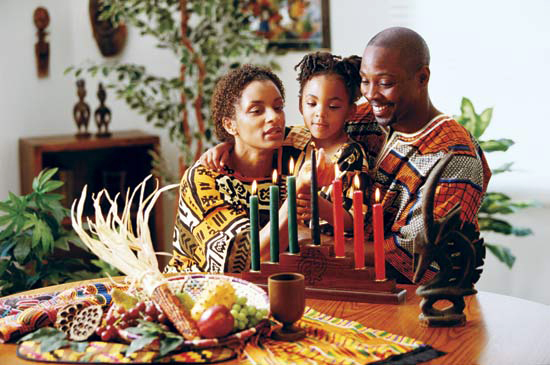 Today is the second day of Kwanzaa and the “holiday” doesn’t end until Jan. 1. Kwanzaa, or “a celebration of family, community and culture” (according to its website), began long ago was invented in 1966 by Dr. Maulana Karenga (who lives in Chatsworth, CA, btw). The day is meant to celebrate (according to the website) the “best of being African and human). And to be fair, Ngoza Saba–or seven principles of Kwanzaa are actually not that bad. Who couldn’t use a little unity, self-determination, collective work and responsibility, collective economics, purpose, creativity and faith? But look at it. It’s obviously suuuuuuper black and makes people as uncomfortable as they are when they realize that Christmas carols are really on the nose and don’t mince words about that whole Jesus Christ business. So a good Oreo must take care to avoid any semblance of having any ties to the holiday. Here are some ways to make sure your end of year is Oreo-tastic and Kwanzaa free! 1. Always have at least a small blanchetourage in tow. This goes without saying as Oreos are always in the company of their white friends. But during Kwanzaa, it is doubly important to be flanked by some non-colors so that no one accidentally offers you a slice of benne cake or dollop of okra. 2. Avoid wearing red, green and black and/or any combination thereof. These three colors are the ones used in the kinara — the Kwanzaa menorah. Decorating your space or person with these colors is just asking for trouble. As is wearing clothes with complicated patterns that might be mistaken for African clothing. Instead, try some nice pastels or the colors from your yacht club’s crest or your family’s tartan. 3. Replace tapered candles with tea candles. The kinara is traditionally filled with long, tapered candles. Regardless of color, take the ones from your centerpieces out and replace them with smaller, less suspicious candles. 4. Keep real menorahs on display. This may seem contrary to the advice above, but it will give you a great opportunity to see if your other Oreo efforts are working. If they are working, guests will immediately recognize the candles correctly. If not, they may ask you if you are celebrating Kwanzaa. While this will sting, it will also remind you to keep that black in check. 5. Should the worst happen, confront it with a smile. If someone does stop you on the street and wish you a good Kwanzaa, do not lash out at them or cry. That will be confusing. Instead, say something like, “Oh, is it Kwanzaa, I just got back from wintering in Banff and I had no idea.” They’ll get the point. Finally, should someone give you a Kwanzaa gift, do keep it. It’s rude to refuse. You can always return it for a nice table wine or Criterion Collection version of Gone With The Wind. For more ways to get out of tricky situations, check out this post on eating chicken, this one on saying the n-word, or this one on how to save face when you’re face to face with another Oreo. What are some holiday traditions–either celebrated en masse or by your own family that you love/can’t stand? Let us know in the comments!